Hate it or love it, we absolutely love it. Marvin The Cube will get you hooked instantly, such a smooth, intuitive mechanics and it’s colorful levels make this game an awesome gaming experience to check out. There is some trickiness in every level though so we decided to create this Marvin The Cube walkthrough each level. Marvin The Cube is one of those games that you can’t stop playing in just a few minutes after downloading. It starts easy enough to learn how it works, but then it gets pretty challenging. 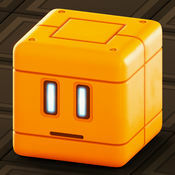 The mechanics in Marvin The Cube are intuitive as they can be. Very easy to get going once you got through the first levels by yourself. Graphics are great and it it runs very smooth at least on our iOS devices. Marvin The Cube has a great variety of elements throughout every level, all of them with very fun interactions like suddenly changing the physics of the cube. Well here are our guides and every Marvin The Cube walkthrough available anytime you need a bit of help with completing a level. This is a game you’ll definitely enjoy (we did, a lot while making the Marvin The Cube walkthrough) so give it a try, and let us know if you like it. Be sure to check out our Homepage for more walkthroughs, solutions and answers for your favorite apps.